Each layer is stacked in a cross-grain configuration and bonded together under heat and pressure. Because of this process, there is added stability in engineered wood flooring. It is less likely to be affected by changes in humidity and can be installed at all levels of the home. Engineered wood flooring has however couple of draw backs... it can not be refinished as many times as real wood can (and yet it get's damaged the same as real wood). It is also quite expensive, it can cost as much or often more than the real hardwood floor. Another problem with this type of flooring is the fact that there is only a handful of engineered flooring manufacturers that provide an extensive warranty for the seal and tightness of the edges. Most of the engineered hardwood will absorb any water spilled on it through the crevices where the boards. connect. Then the boards swell up and... there goes your investment, because the only solution is to replace the floor. However, it is a product that can be installed in any bathroom even one in the basement. Having said all that about the water damage due to seal penetration, engineered flooring is highly resistant to moisture due to the enhanced structural stability, as long as water has no contact with the exposed edges of the product. 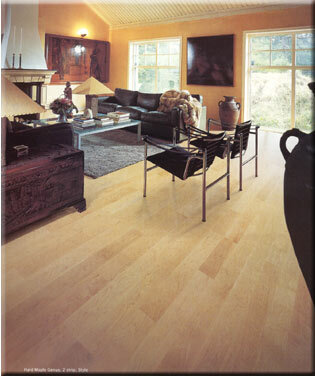 Overall, engineered hardwood flooring can add touch of beauty and sophistication to your home. When you venture out shopping for the right product, please consider only the top quality panels, from reputable manufacturers, providing extensive warranties, including the seal warranty for the water penetration through the edges.